Lucasfilm has announced a new series of shorts set in a galaxy far, far away aimed at younger fans of the franchise. 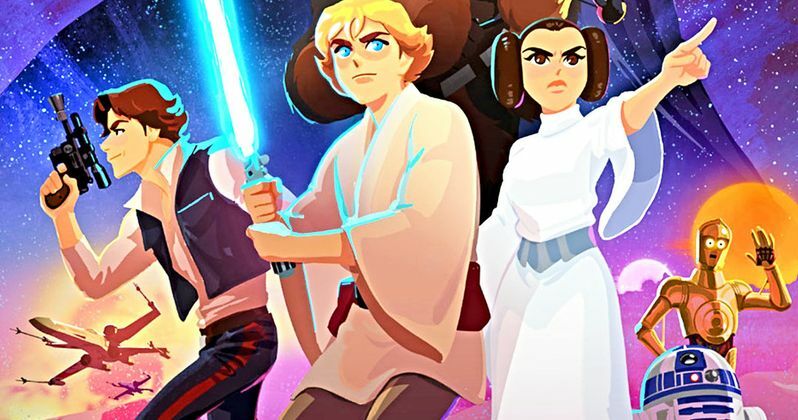 Star Wars: Galaxy of Adventures is set to launch later this month on the new Star Wars Kids YouTube channel, as well as the new kid-friendly website, StarWarsKids.com. Starting on November 30, fans can watch a series of new animated shorts based on iconic scenes from the original trilogy, with more stories heading our way in December and throughout 2019 as well. These new shorts come from director Barry Kelly and the folks at Titmouse Animation. The first series of shorts will be based on the original movies, A New Hope, The Empire Strikes Back and Return of the Jedi, with additional episodes coming in December centered on other fan-favorite characters. Lucasfilm has released a trailer and poster previewing what's to come. James Waugh, Lucasfilm's vice president for franchise content and strategy, had this to say in a statement. "With Galaxy of Adventures, we wanted to craft something that allowed parents to help their kids take their first step into a much larger world whether they were ready to show their kids the films or wanted to find new ways to explore the content." The trailer paints an image of the original Star Wars trilogy recreated in stylistic, breathtaking animation, all presented in a kid-friendly format. Though, it looks like adults could get quite a bit out of this as well. What's particularly cool is that Lucasfilm has taken the original dialogue tracks from the movies and place them underneath this new animation. Some of the best Star Wars in recent years has taken place in the world of animation, with perhaps the best example being Rebels, which wrapped up its four-season run earlier this year. The idea of getting a series of shorts centered on the characters we know and love from the original movie, presented in such a way, should excite fans of all ages. Star Wars: Galaxy of Adventures won't just be direct adaptations of iconic moments of the franchise. Instead, these shorts are said to add a new perspective to these retellings. In addition to the narrative animated shorts, Star Wars Kids will also feature mixed-media shorts on Star Wars Fun Facts, in addition to guides intended to help older fans continue the conversation with their younger padawans. James Waugh also spoke a bit about his broader hopes for Star Wars Kids. "As for Star Wars Kids, I'm excited to tell new stories, to explore new talent and entertainment forms, unexpected forms of animation, a variety of tonal explorations, and get to look at this universe in a fresh way. I'm excited to share this content with my son and I'm excited to see where imagination takes us all!" Lucasfilm previously branched out into short-form animated storytelling with Forces of Destiny. It's also becoming increasingly clear that the small screen is going to play a huge part in the future of the franchise, as there are two live-action Star Wars shows in the works for the Disney+ streaming service, The Mandalorian and a Rogue One prequel centered on Diego Luna's character Cassian Andor. Be sure to check out the trailer and poster for Star Wars Galaxy of Adventures from StarWars.com below.